Cross-sections of early land plants in the Lower Devonian Rhynie chert, most often Aglaophyton, may appear as conspicuous peripheral rings with well-preserved cellular structure while most of the tissue is severely degraded or no more there at all (Fig.1). It is emphasized that the phenomenon is more complex than previously assumed [1,2]. It is described and analyzed here, as done before in Rhynie Chert News 60, 66, with the intention that this, combined with more fossil evidence to be discovered, may eventually lead to an explanation. 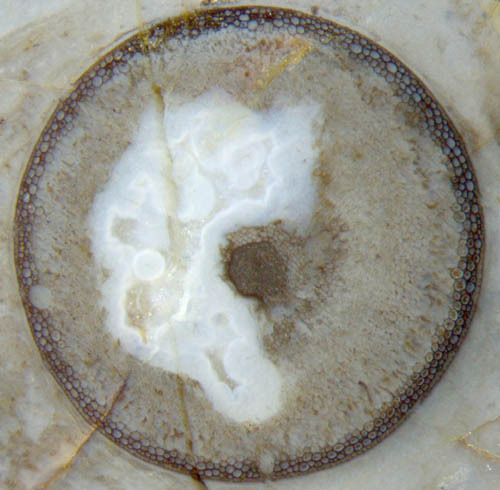 Fig.1: Aglaophyton cross-section 4mm, "hollow straw" aspect with degraded cortex tissue. The "hollow straw" is not really hollow here but all the more informative. Here again the conspicuously different aspects of the ring and the larger part of the cortex gives rise to wonder. It has been stated in the previous contributions that the thickness of the well-preserved ring is not determined by some diffusion depth of silica from outside into the plant lying in the silica-rich water. One argument is based on the observation that most often the epidermis is poorly preserved or missing (Fig.2). Another argument is provided by small patches of phloem seen adjacent to the xylem in Fig.1. The idea of silica diffusion into a small depth while all other soft tissue decays [1,2] is not compatible with the preserved phloem tissue. 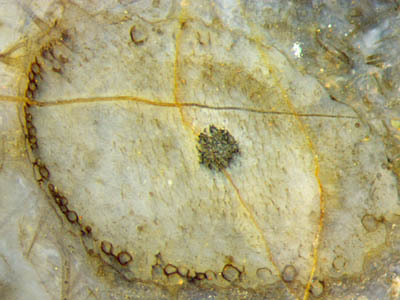 Fig.2: Detail of Aglaophyton "hollow straw" in Fig.1, epidermis seen poorly preserved below left, better preserved on the right. Figs.3,4 (below): Aglaophyton inclined section: xylem (below), phloem, cortex, epidermis largely decayed, and persistent fraction of cortex tissue non-typically arranged as a chute-like strip. Width of Figs. 2mm, 1mm. Obviously that idea is also not compatible with configurations like the one in Figs.3,4, where the small fraction of persistent tissue, usually forming a tube and seen as a ring on sections, forms a kind of chute, seen on sections as a U-shaped strip. The unexpectedly distinct border of the strip seen here seems to defy an explanation. Chute-like strips of persistent tissue are rare exceptions in Aglaophyton but are often seen in Ventarura. It has to be found out whether the similar aspect is merely incidental or hints at a deeper connection. Fig.5 (below): Aglaophyton inclined section: epidermis and cortex decayed except for a chute-like persistent cortex strip. Width of the picture 5mm. Another one of the irregular Aglaophyton "hollow straws" formed as a chute-like strip (Fig.5) shows the peculiar sudden transition from cells with apparently strong and solid walls to no cells at all, similar to but not quite as impressive as in Figs. 3,4. The numerous fungus chlamydospores indicate that the cortex tissue had been consumed by rot due to some fungus. The latter can be assumed for the specimen in Fig.3, too, where the abundant fungus hyphae grown along the cortex are faintly visible as streaks. 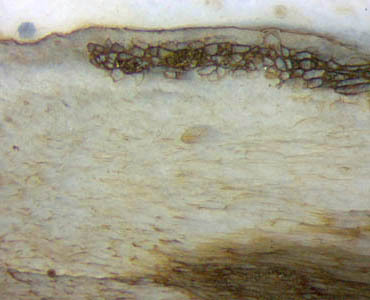 The presence of fungi is also seen in Fig.1 where hypha cross-sections appear as tiny dark dots, and fungus-infested cortex cells are seen with brown fill. As mentioned above, rings of persistent tissue, including chute-like ones, are typical features of Ventarura, where they appear on sections of the upper parts of the plant. They are placed nearly always deep inside the cortex, well away from the decayed epidermis. Hence, they differ distinctly from the persistent rings of Aglaophyton, which are always immediately below the (decayed) epidermis. 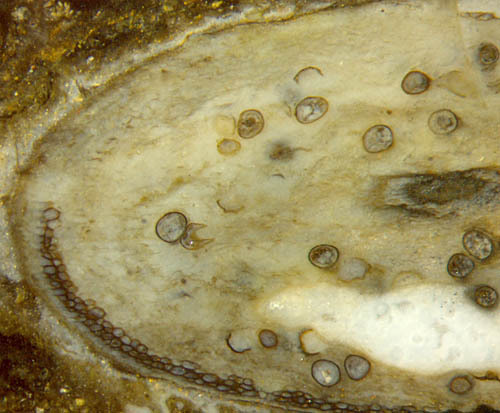 In this connection it is interesting that Trichopherophyton, a relative of Ventarura, usually does not show such ring, but when it does on rare occasions, it is of the Aglaophyton type, adjacent to the epidermis (Fig.6). Fig.6 (left): Trichopherophyton, slightly inclined section with the typical pointed bristles, seen here on the left. Width of the picture 2.8mm. As a peculiarity of this Trichopherophyton section, the cortex appears with two starkly differing aspects: a patch of "normal" tissue, faintly seen on the right of the xylem, and conspicuous cells with apparently strong walls arranged in a chain-like way along the epidermis on the left. Several observational facts indicate that the fraction of the cortex tissue usually seen as a ring on cross-sections became persistent by some modification of the living cells. This is convincingly demonstrated by the repair of the ring after damage, which must have been done by the live plant: see Rhynie Chert News 60, Fig.4. This indicates that the small fraction of persistent tissue must have been of some importance in the life of the plant. One may wonder how the plant managed to distribute the persistence among the cortex cells in a highly selective and well defined way. The idea suggests itself that cortex cells close to the epidermis in Aglaophyton are somehow predisposed to forming a persistent tube while the other cortex cells are prone to decay. This may well be the case but there must be something else involved, as it is obvious from Figs.3-6, where the rows of persistent cells end more or less suddenly. Particularly puzzling is the end of the strip in Figs.3,4. It looks as if the distribution of rot resistance had not been governed by radial symmetry but by some process spreading from cell to cell along the periphery. This applies also to Ventarura, where the predisposition of a fraction of cortex does not concern a peripheral tube (or ring in cross-sections) but a concentric tube well away from the periphery. In the above pictures, the persistent tissue is dark and therefore distinctly seen. It must be mentioned that the dark aspect of the persistent tissue is not an intrinsic property but a secondary effect mostly but not always there, which is not considered here as it had been discussed briefly in Rhynie Chert News 60. - poses the problem of how the rot resistance had been distributed in the cortex in a highly selective way.